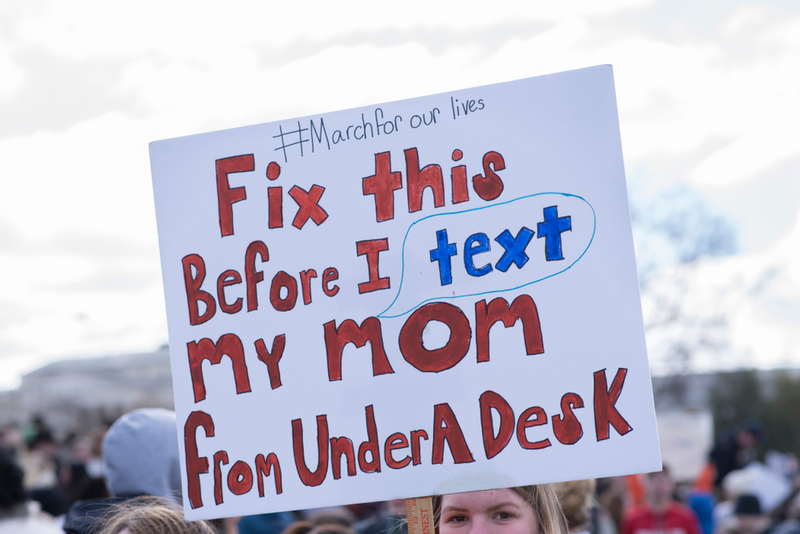 A photo taken from the National School Walkout, a protest against Congress’s inaction on gun reform. On February 14th, 2018, 17 students and staff died by gunfire at Marjory Stoneman Douglas High School in Parkland, Florida. An additional 17 were wounded. The shooter, an expelled student, had threatened to do exactly what he did, and had been reported to the police for threats nearly two dozen times. Yet, he was still allowed to legally purchase the semi-automatic weapons he used to carry out the shooting. Parkland is only one of the latest in a long string of mass shootings at schools across the U.S., but it seems to have been the spark that finally took. On Wednesday, March 14th, survivors of the shooting—along with students from other schools around the country—left their classrooms in a massive walkout. “We have grown up watching more tragedies occur and continuously asking: ‘Why?’” said one demonstrating student, Kaylee Tyner. Tyner is a student at Columbine High School, where 13 children were killed by two of their classmates in 1999. Columbine is regarded as the denouement of the “school shooting era,” though it was far from the first. On March 24th, activists took it a step farther. Teenagers and educators across the country marched in what could very well be the largest protest in U.S. history. Organized by Parkland survivors Emma González, David Hogg, and more, March for Our Lives had an estimated turnout of between 1.2 and 2 million people, 800,000 of which were in Washington, D.C. The march was organized in only five weeks, and it called for lawmakers to address the issues of gun violence. More than that, it called for young people in this country to be politically active, to help change the laws that have allowed tragedies like this over and over again.